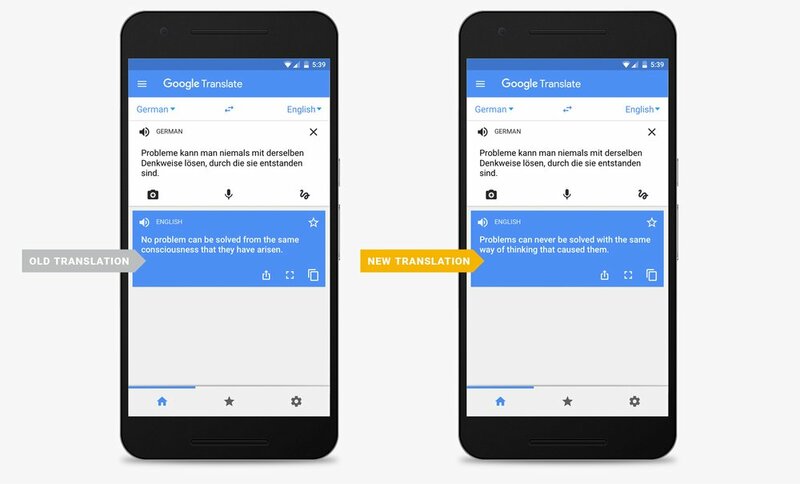 Google announced a big update to its Translate service today that involves Neural Machine Translation. That sounds like some future AI, machine learning science, secretive robotic madness, and it may very well be, but it also means Google Translate is going to get a whole lot better everywhere you use it. Google explains Neural Machine Translation as a system that “translates whole sentences at a time, rather than just piece by piece.” In other words, Google Translate will use this technology to “help it figure out the most relevant translation, which it then rearranges and adjusts to be more like a human speaking with proper grammar.” Instead of getting a translation that is almost as impossible to read as the language you didn’t needed to translate, the translation should return in a much more natural format for you. That make sense? Take a look at the image above and I’m guessing it will. Google is calling this improvement the single biggest leap that Translate has “seen in the last ten years combined.” Yep, it’s a big one. To start, Google Translate will Neural Machine Translation to work to and from English and French, German, Spanish, Portuguese, Chinese, Japanese, Korean, and Turkish. Those languages make up for more than 35% of Translate queries, so we’re off to a good start. Google did mention that the goal, as you probably guessed, is to make this magic happen for all 103 supported languages. Neural Machine Translation will be available in in the Translate app and website.